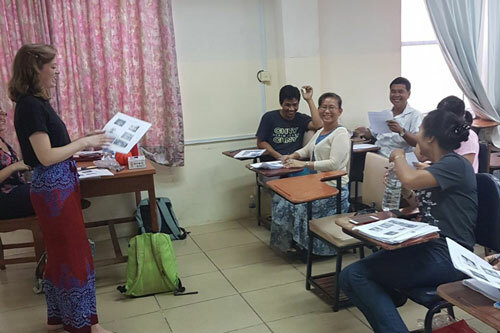 A group of City graduates overcome language barriers in educational trip to Cambodia. This year marked the 11th instalment of the City-Cambodia Project, an opportunity for graduates to live in Cambodia for three months and volunteer at local hospitals and children’s organisations. The project which was created by Professor Tim Pring, visiting lecturer, aims to improve the standard of care around speech and language therapy in Cambodia and focuses on children who are new to education or from deprived backgrounds. Helena Gruenstern, (MSc Speech and Language Therapy, 2017), said: “I was part of the cleft lip and palate team which aimed to raise awareness around speech and language therapy and better equip hospital staff with the necessary skills to deliver care. “The most obvious challenge was the language barrier. Some things could get lost in translation and in some cases, there are no direct translations from English to Khmer. While this was frustrating, we had many laughs about the confusions and would be able to resolve the issue by acting out the meaning or using gestures! “I loved sharing our methods and knowledge with local staff and working collaboratively with them to incorporate speech and language therapy into their work. Through teaching, I have learnt new skills and have been able to take these skills home and incorporate them into my clinical practice. The City Cambodia Project includes the National Pediatric Hospital, Centre for Child and Adolescent Mental Health, Children’s Surgical Centre, One-2-One Cambodia, Smile Cambodia, Paññāsāstra University.